Will Joshua Cribbs determine Jacoby Jones worth? Jacoby Jones is coming off a Pro-Bowl season in which he scored a league best three TDs as a kick returner. He also left his mark in playoff lore as the wide receiver that caught the “Mile High Miracle” and another bomb for a touchdown in the Ravens Super Bowl victory. However, Jones’ regular season as a WR leaves a little more to be desired in 2013, especially with the departure of Anquan Boldin. Jones amassed 30 catches for 406 yards and just one lone touchdown in 2012. To be fair, Jones was only the 5th most targeted player on the team with 54 targets. 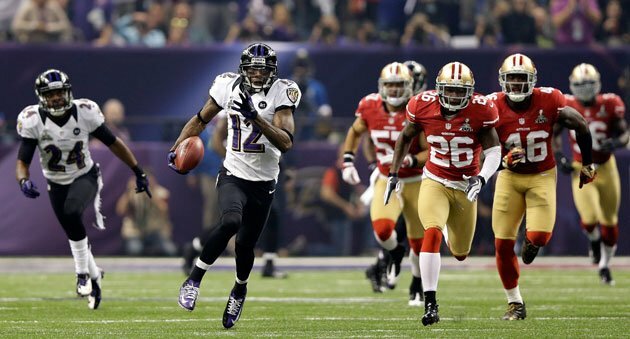 Boldin (112), Smith (110), Pitta (94), and Rice (84) all saw significantly more looks than Jacoby Jones. Under Cam Cameron, Jones notched 13.56 yards per catch. You could certainly say that Cam Cameron misused Jones because, well, he misused the offense a ton. Once Jim Caldwell began calling the shots, Jones increased his ypc to 20.08 in the final seven games, including the playoffs. That leads me to believe that the new regime running the offense prefers to play to their player’s strengths (what a concept) and could continue to use Jacoby Jones as a burner. Maybe this doesn’t necessarily make Jones the number two WR on the depth chart. He still only managed to get about three looks per game under Caldwell, same as under Cameron. Jones is simply a role player and that’s okay. Teams need role players. Jones could remain as simply a role player. Called upon for some 9-routes and returning kicks. So how valuable is Jacoby Jones? Let’s compare him to some of his peers, and one of the game’s top kick returner/role playing receivers. Jacoby Jones was taken in the 3rd round with the 73rd overall pick in the 2007 draft. He hails from the football powerhouse known as Lane College. Oddly enough in that draft, the Ravens selected Yamon Figurs with the very next pick. In that draft, the first player of Jones’ type taken was Ted Ginn Jr., 9th overall pick. After three years with the Miami Dolphins, Ginn was traded to the San Francisco 49ers. After one season, he accepted a pay cut from $2.2MM per year to $1MM in 2011. In 2012, his role as a WR disappeared, catching only two passes. The team also made Ginn primarily a punt returner, cutting back his kickoff return attempts to only 11. The Carolina Panthers recently signed Ginn to a one-year, $1.1MM deal, $750K, a $300K signing bonus, $50K misc. bonus. Also from that 2007 draft are Yamon Figurs and Johnnie Lee Higgins, who are both unemployed by the NFL. Then the farther down you go to the 5th round, you find Steve Breaston. The former Kansas City Chief who signed a five-year deal worth $25 million, with a $5MM signing bonus in 2011. Between 2008 and 2011, Breaston recorded four straight 700+ receiving yard seasons, mostly as a third receiver. He was a decent kick returner in his first few seasons with Arizona, but not so much in the last two years. The Chiefs like Dexter McCluster in that role a bit more. After nagging injuries that caused Breaston to miss six games in 2012, he was released while he would have been due $3.8MM in base salary in 2013. Certainly Jacoby Jones is worth more than these guys, right? He’s more of a threat than Ted Ginn these days. While Steve Breaston has a better track record as a WR, Jones out performs him in on special teams. You always hear, “right player right price,” That $3MM in base salary sounds like the right price to me. It’s even more of a steal if he goes on to win Dancing with the Stars. But what happens if or when he becomes a free agent for 2014? What is Jacoby Jones worth then? That will depend largely on how much Joshua Cribbs will end up getting paid this year. Cribbs is still out on the market. One of the games most feared return men, Pro-Bowls on the resume, and a role player WR like Jones. Cribbs is only a year older than Jones as well. Cribbs doesn’t quite put up as good receiving numbers as Jones (career high 518 yards in 2011), but makes up for it with 11 career return TDs. I expect Cribbs’ deal to set the bar for Jones next contract. Whether Jones goes over or under the bar will depend on his play this year. If Jacoby Jones has the same type of season in 2013 that he had in the second half of 2012, another Pro-Bowl selection, Jones should go over the bar. On the other hand, while Cribbs sits and waits for a team to call him, his price tag is going down by the day. He failed a physical a few weeks back when the Arizona Cardinals had offered him a contract. A torn meniscus he had surgery on hadn’t healed all the way yet. It’s not like he failed a physical because of poor conditioning, so who knows what kind of bearing that will have on a deal. The Cardinals still sound interested in having Cribbs re-evaluated and signed in the coming weeks. If a cheap deal is the best that he gets, like Ted Ginn Jr., that tells you how much teams value a kick returner. Meaning if Jones wants to get paid a nice contract for 2014, something like Steve Breaston got initially from the Chiefs, he’ll have to excel as a WR this season. He’ll have to take advantage of every one of the few looks a game he gets. It seems like most kick return specialists aren’t good WRs. Not all WRs can return kicks. Currently in the game, Percy Harvin is the only one who really excels at both. Randall Cobb also looks to be well on his way. Jacoby Jones is the next closest player in the league with the potential to put up big numbers in the receiving and return game. Jones will be 29 years of age when the season kicks off. Right in the heart of his prime, he’ll be playing for the last big contract of his career. That $3MM base salary could end up looking well worth it to retain Jacoby Jones for 2013.